Today, another place visited whilst on a football away trip. I've been here a couple of times before when it was known as True Brew. The concept has changed a little since those visits. It was a great place to stop off on the way to, or on the way back from the Hitachino Nest brewery, given that it's basically in the shopping centre attached to Mito station. Last time I visited the brewery, (to do the brew on site thing they offer, which is pretty fun), it was quite noticeable that the actual bar area on the brewery premises was pretty small. I'm not sure if this is still the case, but the transformation of True Brew into Hitachino Brewing Mito might be their solution to this problem. There were always a lot of Nest beers available at True Brew, but now the place is exclusively Nest. The guest beers are gone and the Nest selection greatly expanded. Anyway, enough of this long introduction and on with what you need to know. - Shopping centre bar, attached to the rail station, but not without charm. From certain angles you can forget you're in a shopping centre. Lots of tables and a couple of counter areas. Very convenient if you're coming or going by train. It's on the 4th floor of EXCEL Minami, so head up the escalators one floor from the station level and double back on yourself to find the bar. - Nine taps of Nest beer available when we visited, including one special, their Brew Base WIPA. Most beers served in two sizes, glass (320ml) and pint (500ml), so a bit bigger than the sizes you find in Tokyo. The usual suspects are priced at ¥680 and ¥980. The stronger Belgian influenced stuff and the Amarillo Session IPA were ¥750 and ¥1080 and the WIPA was only available in the smaller size for ¥800. Reasonably priced I guess, but then again, it is their own bar! Big selection of bottles too, filling in the gaps in the range, priced at ¥800 each. There's also a beer flight, 3 x 150ml for ¥980, but I don't think you can choose your beers and they are three of the more common ones. Quite a few brewery goods too, glasses, T-shirts etc. - No smoking and no cover charge. But also no wifi... Lots and lots of daytime opening if that's your thing. If you're visiting Mito and you want to drink Nest beer this is clearly the place to go. It actually trumps the brewery as somewhere to drink their beers. But it probably would be a bit weird to travel all the way to Ibaraki for Hitachino Nest and then just go to the bar in the station. 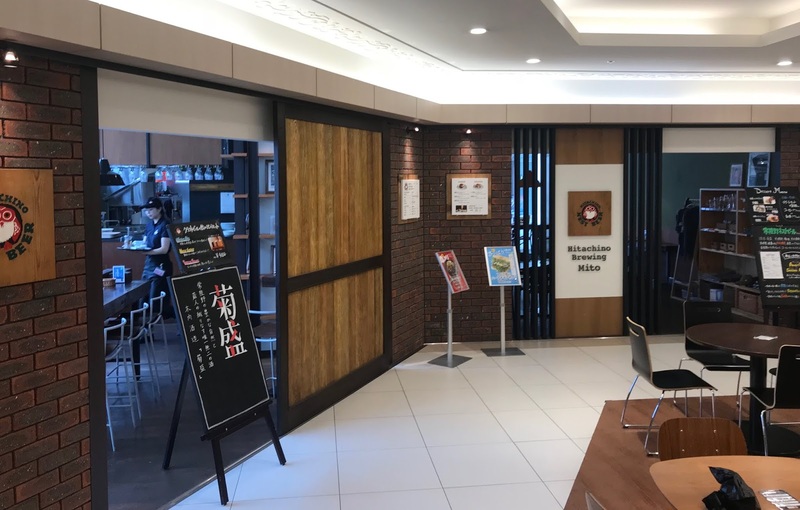 The selection is similarly sized to the Tokyo Brew Labs so you can save yourself a trip and go there instead if you're only interested in drinking the beers. But it's a perfect place to pair with a trip to the brewery or somewhere nice to wait for a train. Or possibly the train after the train you were initially planning to get. I don't like the new Hitachino Bewing Mito pub. I much preferred the True Brew concept. A few of the changes that I don't like include them putting a huge sign in the front entrance doorway and instead have to enter from the right side entrance. Another change that I did not like was their decision to stop using standard pub style pint glasses. Instead they use a kind of goblet, maybe like you mentioned in your report. I hate those glasses. Finally, the staff all changed and are less friendly than they were. One note, I was in there a few weeks ago, and there was WiFi available. Also, you're right about the Tokyo Station Hitachino Brewing pub, it's a good little pub to have a beer while waiting for someone or between train connections. I've been in there a few times.But it is small. Staff also seem friendlier than the Mito Station pub. Thanks for your review.